Again, I'm lacking greatly on my blog posts...... We've been back from vacation for over a month now. Back to a busy life. Let me finish telling you about our vacation. 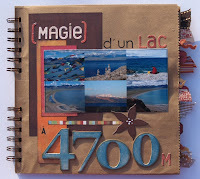 After our trip to Marseille, we finished out the week in Fréjus, then headed to my parents' house in the Loire valley. 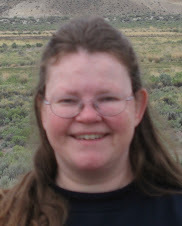 I had limited internet access there, so really no opportune time to blog. My parents live in a tiny tiny (did I say tiny?) village. Their internet connection is by phone! No DSL or cable!!! Super duper slow when you are spoiled like we are here. But, the good part is it's sooooo relaxing at their place. You're in the middle of the French countryside, surrounded by corn & wheat fields, lots of cow pastures, and the occasional quaint village. We spent most of our time relaxing. During our stay there, we did make a couple of side trips. The first was a 2 day trip to Normandie. The drive was only about 2.5 hours away, using mostly "national roads". In France, the highway system revolves around the big cities, so if you are going to Paris, Lyon, Marseille, etc, you can hop on a highway (I won't call them freeways, because they are NOT free!!! You'd better have some money for the tolls!). But if you are not going to a big city, then "National" roads are the way to get around. Let me tell you, for those of you used to nice big US roads, keep dreaming. We're talking small 2-lane roads that slice through little towns and big towns alike. No skirting cities... It's a whole different ball game. We did have my mother's trusted road map book! It came in very handy. Things are well marked, but if you don't know exactly where you are, it can be a little confusing. With the map book, it was really easy. Whew!! (Matt does NOT like getting lost). We started our Normandie visit with the quintessential Mont St-Michel. Oh wait, before we get there, we had lunch in a really really cute restaurant. It was called the Montgomery. For 10,50 Euros, we had charcuterie (cold cuts), a main course (choice of veal kidneys or turkey --- I chose the veal kidneys, haven't had them in years!! Matt went for the safer turkey), pasta, cheese plate, chocolate mouse, all the bread you can eat, wine and hard cider, and coffee (espresso). After a week on the French Riviera, we got used to paying 10 euros JUST for desert!!! Anyways, this was one of the best meals we had. Nice place, nice folks, great food! On to the Mont St-Michel (look it up, it's beautiful --- if I had my camera with me right now, I'd upload some pictures, but I left it at home.... will have to remember to bring it and post pics for you guys to see). Anyways, we had a great time there. My mom told me I had been there before when I was 4 or 5, but I don't remember of course. Then, we headed to St. Mère Eglise. Our main reason for wanting to go to Normandie was that Matt is a big military buff and he really wanted to see where all the D-Day stuff happened. History lesson: St. Mère Eglise is the town where the FIRST paratroopers landed at 2AM on June 6th. Watch the movie "The Longest Day" or "Band of Brothers" and you will see what I mean. In the movie "The Longest Day" there is a scene where a paratrooper chute gets hung up on the church tower as he is landing. Well, that really happened. They guy's name is John Steele and a dummy with a parachute STILL hangs on the church tower to this day. He is truly the town hero. In St. Mère Eglise, we visited the museum, of course the church (which now has beautiful memorial stained glass depicting the landing..... again, I will have to upload pictures later). We stayed at the Aubèrge John Steele (everything is named after him there!) and the next day headed out to see the beaches where the water landings occured (Omaha Beach, etc). We also went to the US cemetary. This was a very emotial trip. The people in that part of France will never forget what the US troops did for them. I'd like to go back some day and see the many other museums and sites we didn't have time to visit. Another side trip we made was to the Chateau de Chenonceau. Very beautiful! Not as big as you would think, LOL!! I really liked it. It's Thursday evening here in France. I've not blogged since we arrived.... we've actually been quite busy, and when we aren't busy, we find ourselves on the beach or taking walks by the harbor. Yesterday, we went to Marseille. The primary purpose was to visit a customer who lives there. We were also hoping to visit the city. As it turns out, I was incapable of driving in Marseille. Talk about a cluster!!!!!! "No rules driving" is pretty much how I describe it. In fact, I was soooo scared, that after an hour of driving down the teensiest one-way streets with delivery trucks facing the other way, intersections where if you don't go for it and cut off someone, you will never go across, and let's not mention all the pedestrians who just step out in front of you with no warning.... oh.... and the mopeds that go whizzing by and around you forcing you to brake instantly.... well, we parked somewhere in a bad neighborhood and called to come get rescued. Luckily, my customer and her husband were not far. They came to the rescue and Christian drove our rental car with Matt in the passenger seat, and I rode with Marjorie in her car. There is no way I was getting back behind the wheel in that madness!!! 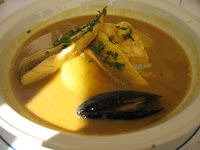 We ended up going to the Port of Marseille and having a wonderful bowl of Bouillabaisse (a fish soup) which is the specialty there. Then we went to the beach for an ice cream, and finally, Christian led us back to the freeway entrance. We had to stop on the side of the road in the middle of a round-about to switch drivers. I felt comfortable taking the wheel back as I could see the freeway and knew the direction home. Today, we drove along the sea coast road almost to St Tropez, but we had to return the car by 2PM, so we didn't go too far. Besides, Matt wasn't too keen (and neither was I) on repeating yesterday's experience. LOL!!!! Tomorrow, we have slated a relaxing day on the beach for our last day here in Frejus. But the weather report is calling for thunderstorms. I'll write more when we get there. On vacation - Day 1? It's Saturday night..... so technically, it's not day 1 of the vacation, but it feels like it. It's the first day our body clocks are adjusted to the time change. We left home Thursday morning for a brutally long trip. Medford to San Francisco, S.F to LAX. LAX to Paris, and Paris to Nice. Got to Nice at 6PM Friday night. Thank goodness I had reserved a room CLOSE to the airport in a 2-star hotel (the French equivalent of a Motel 6). It was so close to the Nice airport that taxis won't even take you there... you have to take the bus. But we crashed and hard! Next day (this morning), we took the train to Frejus where we are staying for a week. We rented a studio apartment overlooking the Mediterranean Sea. The weather here is beautiful, still warm, but all the tourists have gone. This is the off-season. Everthing is less expensive and calmer. Since we are staying close to the harbor, there is a little pier there where people fish. We saw about 8 cats all waiting for a handout. What a life!!! We've only been back from CHA for 4 days, and already we have received 2 products ordered at the show!!! And I know 2 more packages are on the way. It's good to know some companies are fast, even after such a big show. 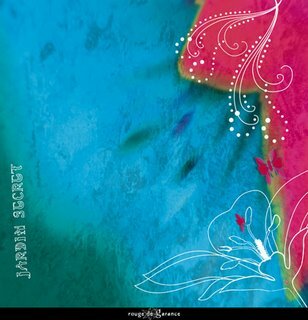 This DVD features lots of simple but elegant techniques that Judi is well known for. 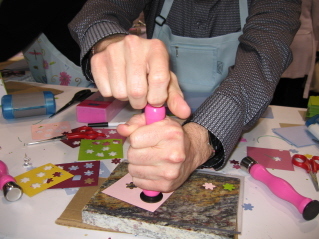 A must have for the beginner or seasoned rubber stamper! 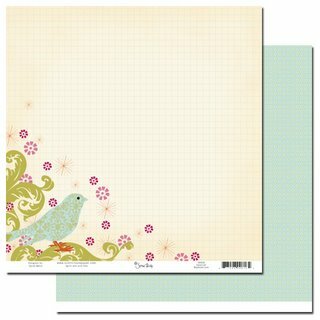 Great also for those non-stampers who want to branch out into card making. Next our order from Zoom Albums came in. Oooooh, these are soooo cute!!! 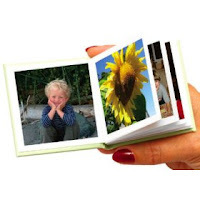 Miniature albums you print at home. I have so many ideas for these little gems! Think of the cute gifts you could make for Grandmas! A little album they can carry in their purse. 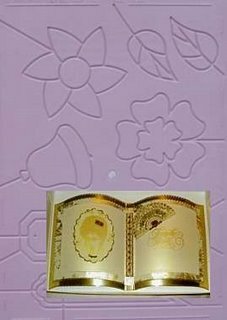 How about party favors, or Bride & Groom albums for a wedding. They take 12 pictures and turn them into a mini album. What comes in 12's? How about 12 years of school pictures, or the first 12 months of your baby's life, the 12 days of Christmas, or a "dozen reasons why I love you" book. You can make a toddler's first reader (take pictures of 12 animals and add the name of each animal for the child to read). Or a mini recipe book for a student in college with pictures of his/her favorite 12 dishes. How cute would a little travel log book be? I can't wait to see what the UPS lady brings tomorrow! 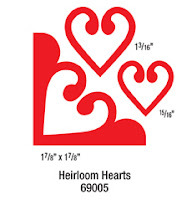 There are 6 punches all together: Hang Tag, Brackets, Symbols, Keyhole, Punctuation and Heirloom Hearts. Each punch will be $18.99 and I will offer a pre-order special on my site with a deal if you buy all 6 at the same time. I can't remember if I talked about clear stamps yesterday, but we picked up quite a few new ones. Autumn Leaves of course came out with another big batch. We picked up a new company (new for us, but they've been around a while) called Impression Obsession. 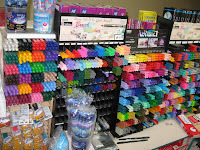 They have some really nice designs for card makers, so we pretty much bought almost all they make in the way of clears. Stampendous also had a few new clears, which of course we purchased. 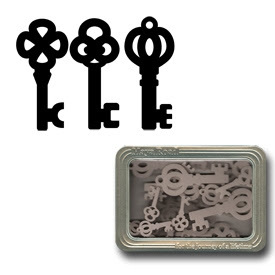 DMD Industries put out a line of very inexpensive clear stamps (some small ones for less than $2, and some regular size sheets as well). We also saw Daisy Bucket's booth had clear stamps, so of course we bought those. Fiskars also came out with some, and you guessed it, we bought them!! Clear stamps were definitely a huge hit at CHA. We would have liked to pick up a few other lines (such as Technique Tuesdays) but we ran out of money. I know a lot of stampers prefer rubber over clear, but clear is what most every place is going to these days. They tend to be less pricey than rubber and they do have the advantage of ease of use with clear blocks. -Basic Grey -- 4 new gorgeous lines + new chipboards and rub ons! 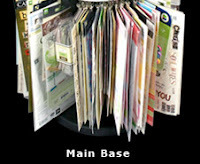 -Zsiage --- we already have their fabulous Scrap-o-dex, but this time we picked up many of their papers, chipboards and sheer elements that can be embossed!! -Dove of the East --- I spoke about them on yesterday's blog edition. -Prism --- specialty metallic papers and vellums. Wait til you see what I found there! 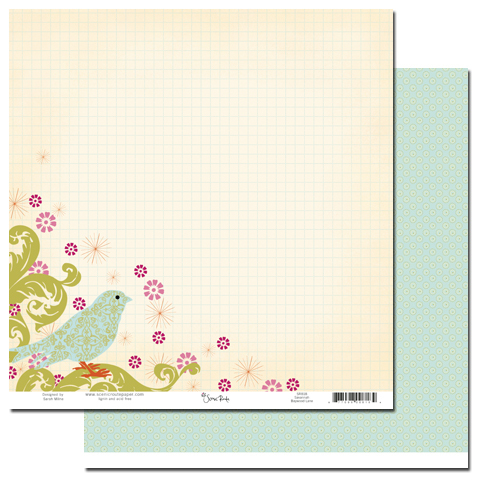 -Fancy Pants -- 3 new lines of papers/stickers, and some fab new overlays!! -Daisy Bucket --- I bought everything new they had! -SEI --- again, everything new. They had the cutest Kitty papers!!!! Can't wait to have those!! -Karen Foster --- I focused mainly on BOY themes here, but got other things too. -Bo-Bunny --- again, I purchased ALLLLLL their new stuff. Another booth that always attracts me is Prima. They did not fail us this time. We re-ordered their Sprites (which we ran out of quickly after CHA Winter), plus they came out with MORE new Sprites, so ordered those too. I'm not too sure when we expect them as Prima is usually quite slow at shipping.... so stay tuned. Maya Road had done it again with dozens more new chipboard album configurations, cute chipboard shapes, etc. Oh yes, they got a chunk of our money too. 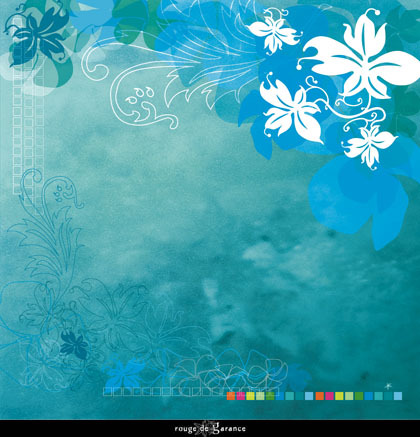 For those of you who are interested in trying out Digital Scrapbooking, we have a great product for you. It's put out by McGill, and it is called Pixel Magic. It's super easy to use, comes with dozens of accessory disks and you can print the results at home or at your favorite store. This will be a fun new tool for me as well. 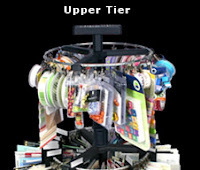 The unit comes as the Main Base (bottom picture) and the Upper Tier can fit on top. 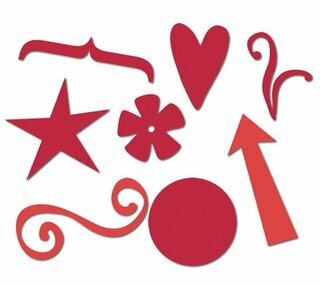 You can clip up all your stickers, ribbons, trinkets and have them right on hand to scrapbook or make cards. Everything is at your fingertips. It revolves and also has tabs so you can organize your stuff by categories. My husband just came home from work.... so it's time for me to go too. I will post again tomorrow with more pictures. Well, we're back from the CHA summer show in Chicago. 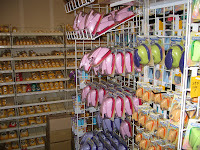 We spent 3 days browsing aisle after aisle of great new scrapbooking and crafting products. Needless to say, our feet are sore and our wallets are empty, but our minds are filled with great ideas, and our hearts with anticipation for the new products to arrive. We're still going through all our notes, and my mind is quite fuzzy on exactly all that we saw and purchased. For today, I'm going to list a few highlights of some exciting products we purchased. Tomorrow, I will blog again with more details and scans I have from catalogs we gathered. 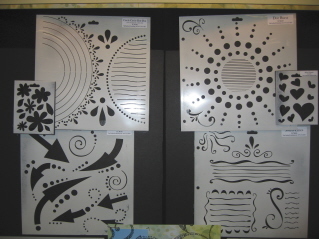 One of the most exciting thing was of course the new line of dies from Spellbinders for the Wizard die cutting machine. 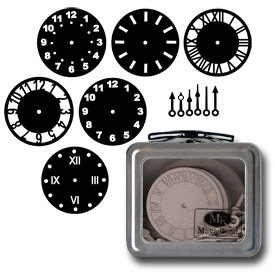 Remember that these dies also work in other personal die cutting machines!! 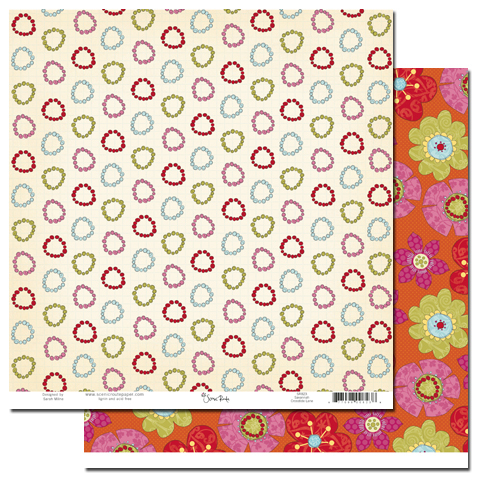 Those of you on my mailing list already know about the Nestabilities dies with graduated circles, scalloped circles, ovals, scalloped ovals etc. Very exciting. I was able to borrow a set of these dies to make a few samples. 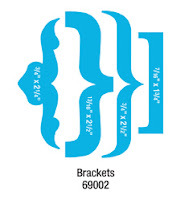 For the moment, you can see what the dies will do by going to www.franticstamper.com/wiz-preview.htm. I will post MORE new dies to that page this weekend, including the new Christmas dies, new Edgeabilities dies and the neat new flower creations dies that make pop up flowers. 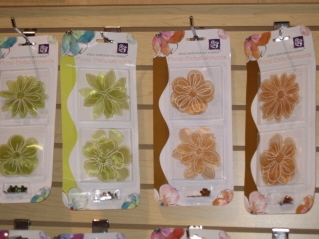 Stampers, cardmakers and scrapbookers can all benefit from these new dies!!! We expect the new dies to be available in late August. Many companies had really nice papers, but by far the most beautiful paper collections I saw came from Dove of the East. 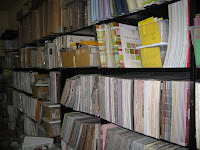 We purchased all 4 of the paper collections, which you can see at http://www.doveoftheeast.com/. 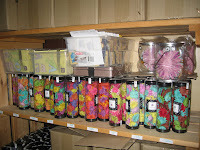 We also purchased the ribbons, the rub ons, and a few of the trinkets. In addition, we purchased a limited quantity of the 2 treasure boxes (China and India). We'll be taking pre-orders on these soon. Here is a picture of the India treasure box. Think of the possibilities: Gift for Grandma's purse, Ornament on the tree, A review of your child's school pictures, Baby's 1st year by month, etc etc etc.... we will post examples of this on the site as soon as we have them. We expect this product in NEXT WEEK!!! For those of you yearning for high-class organizational products, Options (a division of Plano, the makers of tackle boxes) are coming out with really top of the line designer products, from totes to storage boxes in fashion colors. My favorite was a purse size organizer made of ultra-suede in lime color. 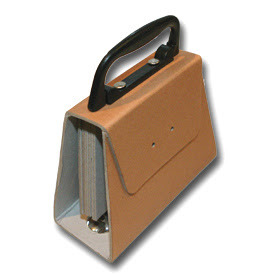 This small tote had many compartments to organize all your basic tools, but would also make a CUTE CUTE purse. Priced at around $35, it was a great value. I've seen similar purses in department stores for triple that price, and they didn't have all the neat features of these. They also had wheeled totes with class!!! 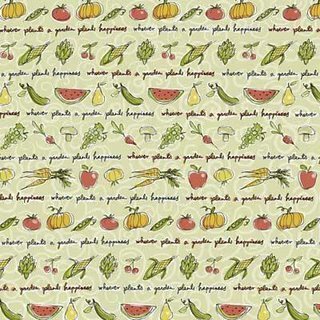 Move over boring black cropping bag!!! We expect our shipment in October and I can't wait! I think these totes will be on many scrapbooker's Christmas lists. Still one of the best tools is the Bind-It-All. We started carrying these after their introduction at CHA in January. Many people have requested some sort of tote for their Bind-it-All and they are coming!!! A cool blue tote with a large compartment for your Bind-it-All (the blue matches the blue of the machine) will be here in September. Meanwhile, new smaller wires are here in stock and ready to ship already. Tim Holtz devotees will love the new Distress Crackle Paints!! I got a chance to watch Tim demo and had my picture taken with him. Too bad my camera is missing... I'm really sad not to have that picture. The Crackle Paints should be available late September and we will take pre-orders starting next week. Well, I must go to bed now.... I will post more tomorrow, with more pictures. If you are interested in putting in some pre-orders, please wait until I post details on my site this weekend. 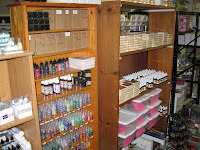 Many of my catalogs with prices are still in the suitcases at this time, so I don't have prices on hand. It's been far too long since I've updated the blog. So sorry about that, but I've been working way too hard. Just in are the new Luminarte Radiant Rain mists. Also, tonight I will be adding the new punches from McGill and the new products from Queen and company. If you're wondering about the MUPPETS stickers, they are in, I just need to get them on the website. Will have that done by this weekend, promise!!! OK, enough chit chat... I need to go add more great products to the site. Stay tuned, I have some card ideas to share. The exquisite papers from France, brought to us by Rouge de Garance, are here!! 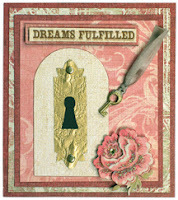 go to www.franticstamper.com/rougedegarance.htm to see all the gorgeous papers! Sigh.... I wasn't going to order the Scenic Route papers, but they are sooo beautiful, I went ahead and did it this morning. My poor credit cards!!!! And last night, the UPS man delivered the NEW S.E.I papers.... so watch for those on the website this weekend. I'm sure more new stuff will come today.... this weekend, I will be putting tons of new stuff on the site. 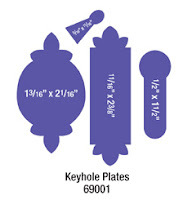 1) Karen Foster Designs --- We ordered everything new they had at CHA + some stuff we missed from Memory Trends. We just got notice that they shipped our order yesterday and it should be here Tuesday. So next week, we should have lots of new papers, stickers, metal charms, brads, etc. We did order the new Scraparatus, but that won't be here for a couple of months. 2) Creative Impressions brads and other embellishments. Their new ribbons are held up for another month or so... but the new brads are on their way. 3) Hot off the Press' new Brad Buddies are coming too!! 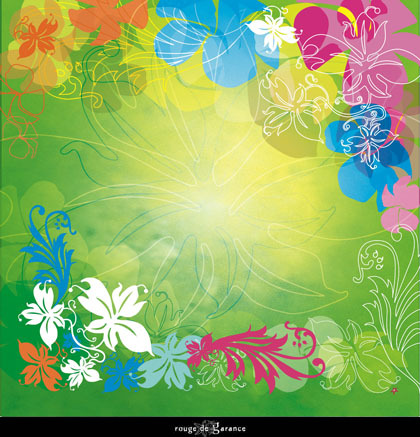 Great new designs in this series such as music, graduation, dance, tropical, zoo, and many more. I think also the German decoupage papers might also be on the way.... as well as possibly some other items. Not all vendors let us know when they are shipping. The Bind-It-All machines should be here next week. More on that later. And lastly, I believe the 8 new colors of Colorbox pigment inks are also on the way.